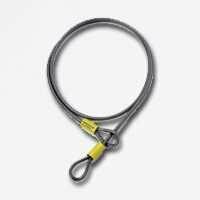 Braided steel vinyl coated cable with extra long oversized swages. Double loop design allows cinching for more usable length and more flexible lock-up options with Kryptonite padlock or any high security padlock. 5/8" diameter cable.